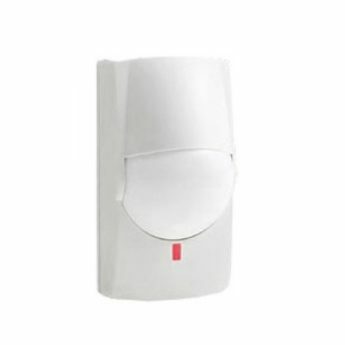 OPTEX dual tech PIR combines Passive Infrared & Microwave to minimize false alarm detection. Because Optex’s unique microwave technology allows the design of antenna settings differently from conventional methods, the Anti-Crosstalk System of the MX-40/50 prevents interference from other microwaves. When several detectors are placed in combination in one location, false alarms may occur due to matching frequencies, because microwaves from each detector may cause interference with each other. But MX-40/50 greatly reduce interference to prevent false alarms. The highly accurate and reliable detector pattern will maintain its sensitivity through the entire detection areas even in high temperature or low contrast environments. Quad Zone Logic creates an extremely high vertical zone density more then two or three times the size of conventional PIRs. These taller zones capture the entire body mass and enable detection of even the smallest temperature variance against the background with improvement to take into count of dead zone created by furniture or partitions. Alarm period Approx 2.5 Sec. Alarm output N.C., 28V DC=0.2A max. Warm up period Approx. 1 min.